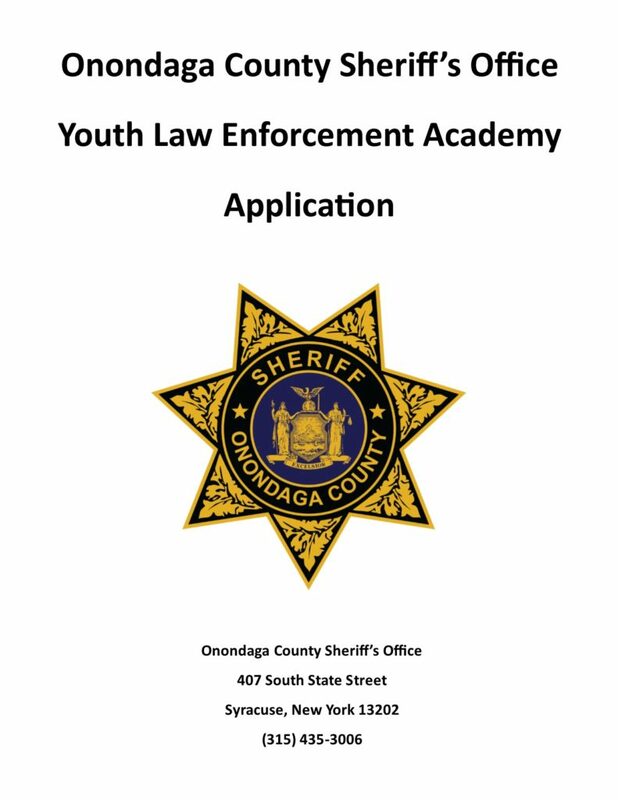 The Onondaga County Sheriff’s Office Youth Law Enforcement Academy is accepting applications from students entering the 8th, 9th, 10th, & 11th grade. The purpose of the Academy is to foster relationships that will bridge the gaps between law enforcement and youth while also exposing them to future careers in serving their community. The goal of the program is to motivate young people to be outstanding citizens and to empower them to act as a positive influence in our community. The week and a half long Academy blends classroom learning with hands on activities to expose cadets to a variety of topics including: Physical training, Patrol tactics, Correction & Custody tactics, Criminal Investigations, K9 demonstration, SWAT & SERT presentations and much more. The Academy meets weekdays from 8:30 a.m. to 3:00 p.m. Cadets will be expected to be on time each day and should be picked up no later than 3:30 p.m. They will need to bring a bag lunch for each day. The cadets will receive a t-shirt along with a water bottle. There are a limited number of openings. To be considered, candidates must prove a “C” or better grade average and must complete all forms include: recommendation, signed releases and waivers, and a short essay. The summer 2019 Youth Law Enforcement Academy will be held from July 15–26 (8:30 a.m. – 3:00 p.m. each day). The deadline for the application is June 1, 2019. Click on the application for further details.